약사불, 아미타불, 석가불, 미륵불 등 4불 각각의 법회 장면을 한 화면에 압축하여 그린 독특한 형식의 불화이다. 화면 윗부분부터 시계 반대 방향으로 약사불, 아미타불, 석가불, 미륵불을 배치하고 그 아래쪽에 서있는 모습의 보살과 사천왕상을 그려 넣은 다음 맨 아래 부분에 그림에 대한 내용을 적어 놓았다. 약사불은 무릎 위에 올려 놓은 왼손에 약합을 들고 있는 모습이고 아미타불은 8대 보살이 주위를 에워싸고 있다. 4불을 제외한 나머지 공간에는 보살이나 사천왕상, 여러 중생들의 모습을 가득 그려 넣었다. 이러한 사불 구성은 사방석불의 신앙에서 비롯한 것으로 죽은 사람의 명복을 빌고 현세에 살고 있는 사람의 편안함을 기원하는 두가지 면을 모두 담고 있다. 조선 명종 17년(1562)에 그린 이 그림은 풍산정 이종린(1536∼1611)이 자신의 외할아버지인 권찬(權纘)의 명복을 빌기 위해 조성한 것이다. 권찬을 비롯하여 이종린의 할머니인 숙원이씨 등 6명의 명복을 빌고, 권찬의 부인으로 생각되는 정경부인 윤씨, 이종린의 아버지인 덕양군 부부 등 9명의 복을 빌고 있다. 주변 사람들의 잇따른 죽음을 겪으면서 부처의 힘을 빌어 위로받고자 이 그림을 만들게 된 것으로 생각된다. 이 그림은 기록이 거의 그대로 남아 있어 그림을 조성한 사람과 사연 등 그림과 관련된 여러 상황을 이해하는데 많은 도움을 주고 있고, 조성연대가 확실하면서도 독특한 구성의 보기 드문 조선의 불교 그림으로 가치가 크다. 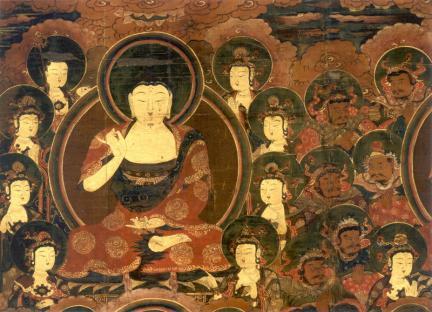 This is a unique style of a painting containing the four compacted scenes of sermon sessions attended by the Bhaisajyaguru Buddha, Amitabha Buddha, Shakyamuni Buddha, and Maitreya Buddha. 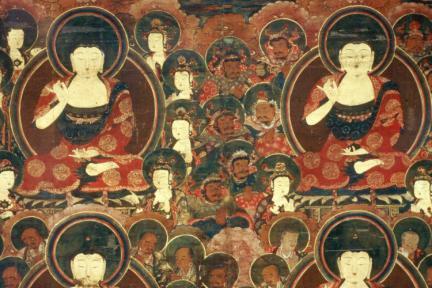 The piece displays the Medicine Buddha, Amitabha Buddha, Shakyamuni Buddha, and Maitreya Buddha in a counter-clockwise direction. 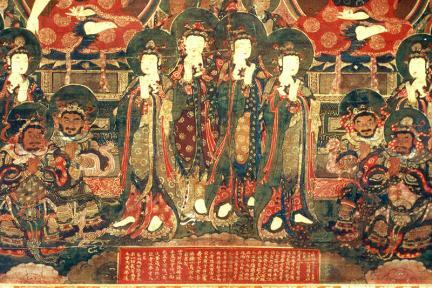 Below them are images of standing bodhisattvas -- the Four Guardian Kings -- and information on the pictures at the bottom. The Medicine Buddha holds a medicine casket in his left hand, which is placed on the lap. 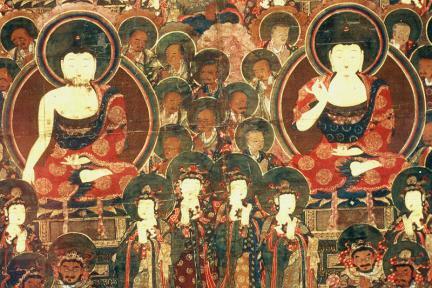 The Amitabha Buddha is surrounded by eight bodhisattvas. 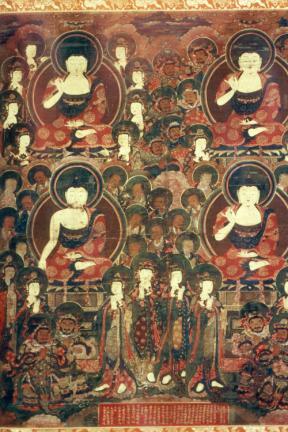 The empty space is filled with the images of bodhisattvas, the Four Guardian Kings, and people. 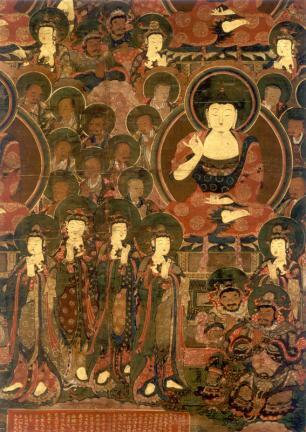 The four Buddhas contained in a painting were based on the wish to pray for the peace of both the dead and the living. The painting was made by Yi Jong-rin (1536-1611) in 1562 (the 17th year of King Myeongjong’s reign) to pray for the six deceased, including his grandfather-in-law Gwon Chan and grandmother and for the nine living, including Ms. Yun (supposedly his grandmother-in-law) and father Yi Gi. Perhaps Yi Jong-rin made this painting out of a wish to get consolation with the help of Buddhas concerning the death of people close to him. This piece is a valuable material, one that provides clear information on when it was made and displays unique composition.